It’s almost Christmas and you need a gift for your favorite runner. Now what?? Here is my list of best ideas for 2016. This list includes ideas for all budgets and most are available for quick shipping. 1. Fashletics– motivational jewelry for all runners. I wear my “dig deep rise up” daily. I never take it off. 2. Honey Stingers– running fuel is good fuel. Honey stingers are gluten-free and made out of honey..not junk. 3. Race entry– If you know of a specific race, paying for the registration is a GREAT gift. If you have no idea, a Visa gift card to use towards a race entry. If you know for sure that your runner is planning to race an early 2017 Rock ‘n’ Roll race, use KATRINARUNS for a discount! 4. ProCompression socks– these are the best in the business and worth every penny. Check Facebook for frequent discounts. 5. Nathan flask—for water. Or whatever fuels your runner’s training. 6. Porcupine balls– these are amazing! They feel like mini massages on muscles and feet. 7. Road ID-no runner should be outside without one. 8. Project Repat– Turn those boxes of race T-shirts into a quilt. I would LOVE to do this once we move into the house and I can find my shirts. 9. Shoes-Just like races, runners are very picky about their shoes. Unless you know for sure they want the Saucony Freedom (of course they do!) I would suggest a gift card towards a local running store or a Visa gift card specifying that you want to give the gift of running shoes. There it is! 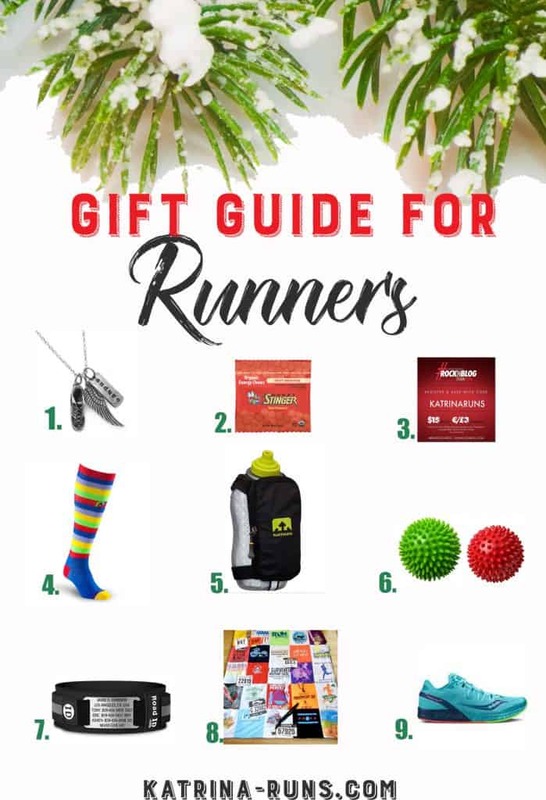 A quick list of budget and fancy schmancy running gifts for runners of all shapes, sizes, and abilities. Merry Christmas!